Could the Panthers be in the market for a backup quarterback? They’re meeting with Auburn signal-caller Jarrett Stidham today, while Carolina has spent “considerable time” with West Virginia’s Will Grier, according to Tom Pelissero of NFL.com (Twitter links). Cam Newton missed two starts last season, and the Panthers were subsequently forced to rely on unproven options like Taylor Heinicke and Kyle Allen under center. Head coach Ron Rivera indicated earlier this year that Carolina would likely eschew a veteran quarterback addition in favor of utilizing the draft, but as Jourdan Rodrigue of the Charlotte Observer tweets, it’s unclear how high of a pick the Panther are willing to use in order to land Newton’s new backup. Stidham, meanwhile, has also visited the Giants, per Pelissero. Florida State edge rusher Brian Burns‘ next visit will be with the Buccaneers, as he noted on Chris Simms Unbuttoned (link via Josh Alper of Pro Football Talk). After sitting down with Tampa Bay, Burns is expected to meet with the Lions, Giants, and Colts, the latter of whom has shown the most interest in Burns thus far. The ex-Seminole could come off the board within the top-10 selections of the draft, and he’s viewed as one of the best pass rushers in the 2019 class. After posting 23 sacks and 38.5 tackles for loss during his collegiate career, Burns tested like an elite athlete at the scouting combine. Giants head coach Pat Shurmur prefers a veteran backup behind starting quarterback Eli Manning, as Ryan Dunleacy of NJ.com writes. New York re-signed Alex Tanney last month, and if he’s set to serve as the club’s No. 2 signal-caller, 2018 fourth-round pick Kyle Lauletta‘s roster spot could be in danger, especially if the Giants select a quarterback early in the upcoming draft. Big Blue spoke repeatedly about inserting Lauletta into game action last season, but he ultimately attempted only five passes (all of which were incomplete and one of which was intercepted) in Week 13. He was subsequently deactivated for the next two contests. Lauletta’s late October arrest probably doesn’t help his roster chances, either. More Alliance of American Football veterans could be heading to the NFL. The Vikings worked out linebacker Davis Tull on Wednesday, tweets Pelissero, and will audition linebacker Greer Martini on Thursday, per Rob Demovsky of NFL.com (Twitter link). More than 40 AAF alums have landed NFL contracts since the fledgling league folded, and Tull and/or Martini could force that number to rise. Tull, notably, was a fifth-round pick of the Saints in 2015 but has yet to appear in an NFL game. Bashaud Breeland‘s workout parade concluded in Green Bay, but his Packers contract is nearly its expiration. The veteran cornerback would re-enter the market in a better position, doing so a year after a golf cart-related injury harpooned his value. But Breeland, who said many teams would not medically clear him after his foot injury, would be interested if the Packers approached him about staying before he hit the market. Although, he said the Packers have not discussed an extension with him yet. The Packers are not known as extravagant spenders but are keen on locking up their own talent. Breeland has only played in four Packers games, but on Sunday, the former Redskins starter recovered a fumble and returned an interception for a score. Both Tramon Williams and Davon House‘s contacts expire at season’s end as well, but the Packers still have recent high draft picks Jaire Alexander, Josh Jackson and Kevin King locked up long-term. Next year’s cornerback market may include the likes of Darqueze Dennard, Ronald Darby, Bradley Roby and Bryce Callahan while also housing veterans Morris Claiborne, Kareem Jackson and Brent Grimes. Here is the latest from around the league as Week 14 winds down. Zack Martin re-aggravated his MCL sprain during the fourth quarter of the Cowboys‘ overtime win over the Eagles on Sunday, and Todd Archer of ESPN.com notes the All-Pro guard will likely be limited in practice this week. Martin has never missed a start in his five-year career, but MCL sprains are often multi-week injuries. The possibility Martin misses multiple games in order to right himself for an expected playoff game is on the table, Albert Breer of SI.com notes. If Martin does sit against the Colts, Connor Williams would start at right guard, per Archer. So far, the prevailing word surrounding possible top-five pick Justin Herbert is another year in Eugene, Ore. But longtime evaluator Gil Brandt, now with NFL.com, tweets he would make substantial bet that the Oregon quarterback declares for the 2019 draft and becomes a top-five selection. Teams like the Giants, Jaguars and Buccaneers would likely be interested if Herbert left early. Texas Tech wide receiver Antoine Wesley will depart school early. Responsible for 1,410 yards this season — third-most in Red Raiders history behind Michael Crabtree and Keke Coutee — Wesley announced Monday (on Twitter) he will leave Lubbock and head to the NFL. Scot McCloughan could be a name to watch in the Raiders‘ GM or de facto GM search, Vic Tafur of The Athletic writes (subscription required). The former Redskins and 49ers GM interviewed with the Raiders for a position under Reggie McKenzie after the 2014 season, but Tafur notes McCloughan wanted personnel control. He then took Washington’s GM job before an ugly divorce. Jon Gruden and McCloughan’s tenures in Green Bay briefly overlapped in the mid-1990s, and Tafur notes McCloughan got along well with Jay Gruden in Washington. The Broncos worked out 15 players on Monday. Defensive linemen Winston Craig, Jon Cunningham, Marcus Hardison and Christian Lacouture took part in the group audition, per Mike Klis of 9News (Twitter link). Defensive backs Jude Adjei-Barimah, Sojourn Shelton and Henre’ Toliver joined linebacker Greer Martini in working out in Denver, per Klis. Jake Ryan enjoyed a breakout 2017 season, but the fourth-year linebacker may not have a chance to build on it. At least, not right away. While it’s not certain just yet, the Packers fear one of their starting inside linebackers suffered a “significant and potentially season-ending” right knee injury, Rob Demovsky of ESPN.com reports. Pro Football Focus’ No. 19 overall linebacker last season, Ryan suffered this setback during an 11-on-11 drill at Packers practice Monday. The former fourth-round pick, who’s entering a contract year, has started 27 games with Green Bay since his rookie season. If it’s determined Ryan will miss time, Demovsky notes third-round rookie Oren Burks could be thrust into action alongside Blake Martinez. The Packers have also been impressed with rookie UDFA Greer Martini, per Demovsky. 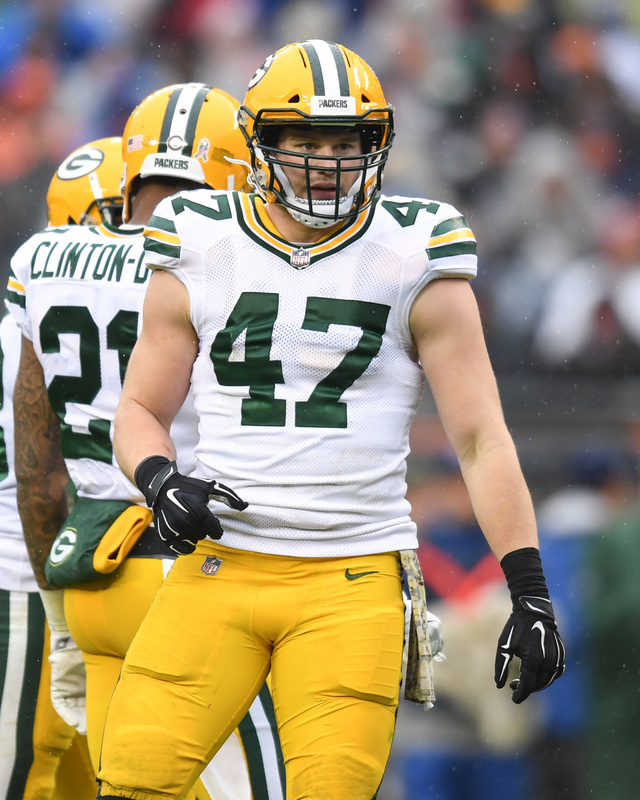 Ryan played 506 snaps last season, and although his 79 tackles were well off Martinez’s league-leading 142, PFF preferred his coverage to Martinez’s work as Green Bay’s other primary linebacker. Safety Kentrell Brice, whom Demovsky writes may be the leading candidate to replace Morgan Burnett, was also carted away from practice Monday. Brice was running with Green Bay’s first-string defense. Josh Jones, a 2017 second-round pick, replaced Brice with the starting defense.